We spent yesterday (my birthday, I promise not to mention my birthday in any more posts...at least until next year) at the Joyce Kilmer Memorial Forest, an untouched wilderness old growth forest that was dedicated to Kilmer, a poet and a soldier. Kilmer was killed during WWI while searching for enemy machine guns in a forest of France; it was the Veterans of the Foreign Wars who requested an appropriate stand of trees be set aside as a living memorial to him. His poetry captured the essence of the common yet magnificent things found in nature and is best known for his poem Trees. Being that this particular birthday was momentous for me, it seemed fitting that this is where we would spend the day...the poem was read at my brother Marc's memorial service as we planted a living oak in his memory, and it happens to be my dad's favorite poem...while the decision to visit the forest was made without these things in mind, it seems serendipitous that's how things unfolded. ...the forest has very few flowers because the tall canopy doesn't allow much light to reach the ground...but I did come across some very large Jewelweed blooms...they were almost twice the size of the ones around our cabin and interestingly they were all yellow (there were no orange/red blooms, the color predominating our woods). 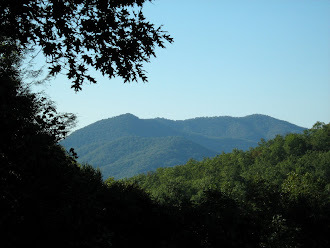 We decided to head back east toward home (the forest is almost as far west in NC as you can get, a couple hours from the cabin) looking to see if we could find a dry place to picnic. On the way, we stopped at the beginning of the Cherohala Skyway, a trail similar to the Blue Ridge Parkway...we'll be coming back for that drive some day! We ended up visiting 3 wineries on our way back to the cabin, which made for a lovely winding trip back home. I'll tell you more about those stops tomorrow. It was the perfect way to spend the day! Sounds lovely. I can relate because occasionally we visit the giant Sequoia and redwoods here in northern CA. The quiet in those stands has a different quality to it. Tinged with awe. Wondering what the early explorers were thinking when they saw those big trees. Thank you for taking me along on your hike...beautiful and memorable! Hugs! Thank you Lindah! I've never been to the redwoods, but I've read a lot about them and I can imagine their majesty!